Founded in 1010, Hanoi is the capital city of Vietnam which is rich in culture, tradition and history. There are many wonderful places to visit such as Ho Chi Minh’s Complex and Mausoleum, the Old Quarter, Temple of Literature, Tran Quoc Pagoda plus many other fantastic pagodas and temples. There are also several wonderful museums with absorbing exhibitions such as Vietnam Ethnology, Army, History or Fine Art Museums. The locals’ daily life is also fantastic to experience and a must whilst exploring Hanoi. Spending hours in the Old Quarter and its 36 old streets is fascinating and rewarding. Visiting Dong Xuan or Hang Be Market early in the morning or late in the afternoon will present a unique view of the city. Sit down at a side street café, enjoy Vietnamese coffee and while away an hour or two people watching. What may come as a surprise is that Hanoi is also a superb golf destination. 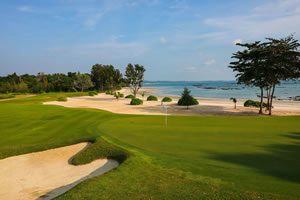 Recently, more and more quality golf courses have been built in the area including King’s Island Golf Club, Sky Lake Golf Resort, Van Tri Golf Club, Tam Dao Golf Resort, Long Bien Golf Club, Legend Hill Golf Club and Chi Linh Star Golf & Country Club. All the courses are near to the city; around 36 km. Vietnam is investing in road and freeway infrastructure which greatly improves travel time. The courses above are all created by experienced designers like Robert McFarland, An Lee Hwan, Ronald Fream plus others who have taken advantage of the natural local beauty, unique countryside and exotic environment to build something special. 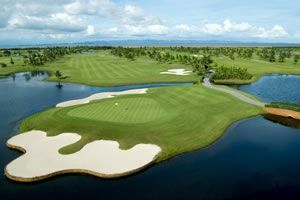 Offering players two amazing courses; Mountain View and Lakeside, the King’s Island Golf Club is situated on 350 hectares of land with 1500 hectares of waterfront that afford spectacular views of Dong Mo Lake with the mountain as a backdrop. Sky Lake Resort & Golf Club is destined to be crowned one of Asia’s premier golf resorts. With 36 holes of championship golf, and resort facilities being planned, the Sky Lake Golf Resort offers golfers two championship courses; the Sky and Lake Courses both of which are superb. Chi Linh Star Golf & Country Club has 27 holes and is already considered one of Asia’s best, adopting the slogan “The Best Place to Play”. It is one of Vietnam’s most famous, located in a beautiful valley with stunning natural landscapes, lakes, forests and trees…it is truly a wonderful place to spend a day’s golf. Besides exploring Hanoi and playing at amazing courses, take the opportunity enjoy a two-day tour to Ha Long Bay – the world’s newest Natural Wonder. Cruise on a luxury boat, staying overnight, and enjoy kayaking, swimming and absolute relaxation lounging on the sundeck. Experience a spectacular sunset over Ha Long Bay which will be a fitting culmination to an experience of a lifetime in Vietnam’s jewel Hanoi.